In my column in Skeptical Inquirer (November/December 1996), I dealt with the major cases of alleged spontaneous human combustion (SHC) reported in Larry E. Arnold’s book Ablaze! 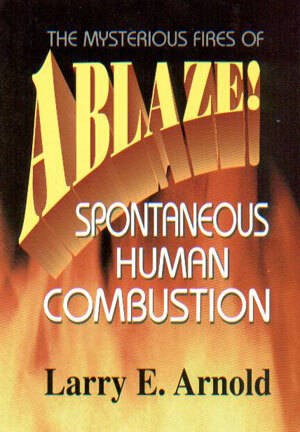 The Mysterious Fires of Spontaneous Human Combustion (1995). Although that selection revealed some of the pseudoscientific attitudes behind SHC, it perhaps did not go far enough to reveal just how silly some of the cases attributed to the imagined phenomenon are. One such case in Ablaze! is that of a “baffling” and “abnormal fiery accident” that occurred “about fifteen miles southeast of Baltimore, in Arundel [sic] County, Maryland” (actually Anne Arundel County). The date is rather vaguely given as “early April 1953,” a curious way of expressing it, since the accident transpired on April 1 (Baltimore Sun, April 2, 1953). Arnold provides not a single source citation for the case other than to quote briefly the late Frank Edwards, one-time columnist for Fate magazine and author of several mystery-mongering books, like Stranger Than Science , notorious for their errors and exaggerations. Here, Maryland and State Police found Bernard J. Hess in his overturned car at the bottom of a twenty-foot embankment. The Baltimore man had a fractured skull. Therefore, the cause of death appeared obvious, the case routine. Then the coroner investigated. Routine quickly ceased. Although he found no trace of fire damage to the wreckage, the coroner discovered first- and second-degree burns covered two-thirds of the dead man’s fully clothed body. Police failed initially to notice Hess’s searing because . . . well, because his garments hadn’t burned! Authorities concluded that Hess’s severely blistered skin would make it impossibly painfully [sic] for him to dress himself after being burned. Contemporary reports do not mention officials finding any electrical or fuel problems with the car that would have caused his injuries. Did Hess fall victim to foul play at the scene, as unknown assailants stripped Hess naked, doused him with unidentified chemical accelerants and lit them, then re-dressed and drove their victim to a location remote from the crime to push him over the embankment in his car? No evidence supported this. Did Hess succumb to SHC? Whereas Arnold insists that “contemporary reports” give no clue to the mystery, in fact newspaper accounts actually report the official medical examiner’s determination. First, however, the reader is invited to provide a plausible solution to the mystery. There are several potential hypotheses, each more credible than spontaneous human combustion, but you may ignore Arnold’s deliberately silly scenario of “unknown assailants” stripping, burning, and re-dressing the victim. Instead, simply consider the circumstances of an overturned car and the damaged skin coupled with unburned clothing. Please pause here to construct your hypothesis. Interestingly, Bernard “Whitey” Hess was a convicted forger who had been released on probation. He had used another man’s credentials to pose as a potential auto buyer and thus steal the convertible in which he died. His wife — then serving a sentence for embezzlement — was notified in jail of his death (Baltimore Sun, April 2 [evening ed.] and 3, 1953). Obviously, the Hess case had nothing to do with spontaneous human combustion, as Larry Arnold should have realized. Arnold, who is not a physicist but a Pennsylvania school bus driver, had no justification for asking ominously, “Did Hess succumb to SHC?” The unburned clothing should have led any sensible investigator to one of the possibilities limited by that fact: for example, that Hess had been burned previously, or his skin injuries were caused by steam or hot water, chemical liquids or vapors, or some type of radiation (possibly even extreme sunburn through loosely woven clothing). In any event, Arnold could have done as I did and sought out the newspaper accounts of the day. It would have saved him from yet another folly. I am grateful to my co-workers Vance Vigrass, Dana Walpole, and Etienne Ríos for their helpful suggestions and discussions. Arnold, Larry. 1995. Ablaze! The Mysterious Fires of Spontaneous Human Combustion . New York: M. Evans and Company, 182-183. Baltimore News-Post . 1953. Mystery burns caused by gasoline, doctor reports. April 2 (B). Baltimore Sun . 1953. Man hurt in auto crash dies here. April 2. Baltimore Sun . 1953. Mysterious death of forger probed. April 2, evening edition. Baltimore Sun . 1953. “Burns” on the body of forger ruled out as cause of death. April 3.